Sun, surf, shopping, restaurants and beachfront apartments are the perfect ingredients for a sublime Sunshine Coast holiday. The Breeze Apartments are the Mooloolaba beach accommodation for your next holiday. Whether you’re a couple looking for an easy weekend getaway, or a family that require a warm and sunny holiday destination, our beachfront resort offers superb accommodation right where you want it. There’s an endless stretch of Sunshine Coast to explore, from Caloundra to Noosa. 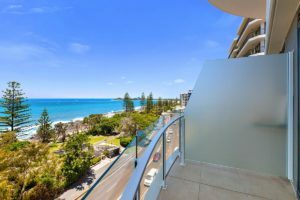 You have plenty of choice with beaches, starting with Mooloolaba Beach on your front doorstep. Our very distinctive building features stylish and comfortable self contained one, two and three bedroom apartments. 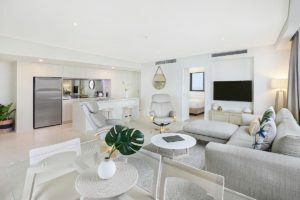 Ocean views that go on forever, and superb spaces that are equipped with furnishings that you thought only lived in magazines, are the order of the day at this Mooloolaba resort. Our courtyard is a serene and relaxed entertainers setting with a lovely heated pool, outdoor spa, BBQ and outdoor dining and reclining furniture. Just the perfect spot to enjoy Mooloolaba’s world famous prawns. The seafood markets are on the river foreshore, just past Underwater World, where you can choose from a wide range of fresh local seafood. Buy fresh and cook yourself or ask for it to be cooked for you and enjoy in the nearby park area, makes for very relaxed dining. The range of restaurants in Mooloolaba is beguiling. From fresh and contemporary Australian, Euro styles, to South East Asian. All there to delight the palate and enrich the waistline. Of course, on your days being good, our fully equipped chefs kitchens and dining spaces in the apartments mean you dine like kings and queens. 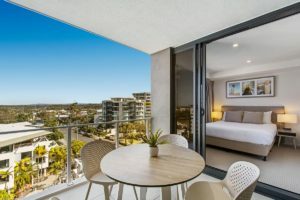 Your Mooloolaba beach accommodation is waiting for you. Can you smell the ocean breeze and the seafood barbeque wafting your way? The Breeze Mooloolaba will carry you away. Book now.